In January 2019, the Defense Intelligence Agency (DIA) released its unclassified assessment of China’s military capabilities, with the telling subtitle: “Modernizing a Force to Fight and Win.” As DIA director Lt Gen Robert Ashley explained: “China is building a robust, lethal force with capabilities spanning the air, maritime, space and information domains which will enable China to impose its will in the region.” He went on to emphasize: “…the PLA [People’s Liberation Army] is on the verge of fielding some of the most modern weapons systems in the world. In some areas, it already leads the world.” Such a stark warning stands in direct contrast to the presumed unilateral super power status America has enjoyed since the end of the Cold War nearly three decades ago. For the first time in a generation, America’s global interests are at risk. Failure to win when contested by either China or Russia would have negative consequences not just for the United States, but for the entire free world. Accordingly, it is time to prepare deliberately and prudently to achieve levels of capability to deter conflict with these states, and if necessary win if deterrence fails. Nowhere is this truer than for the U.S. Air Force. In the words of Air Force Secretary Heather Wilson, “The Air Force is too small for what the nation expects of us.” Nor is Secretary alone in her assessment. During a 2017 hearing, then Senate Armed Services Committee Chairman John McCain declared: “This is a full-blown crisis, and if left unresolved, it will call into question the Air Force’s ability to accomplish its mission.” The baseline reality is that the Air Force is operating the smallest, oldest, and least ready aircraft force it has ever fielded in its history. In 1990, the Air Force fielded 3,206 fighters and 737 bombers. Today, it has just 1,731 fighters and 157 bombers. Mobility aircraft like tankers and transports were also slashed by over half. Secretary Gates’ folly is evident in what he derided as a military preoccupation with the future. The future he disdained is here today, and it came faster than anyone anticipated. 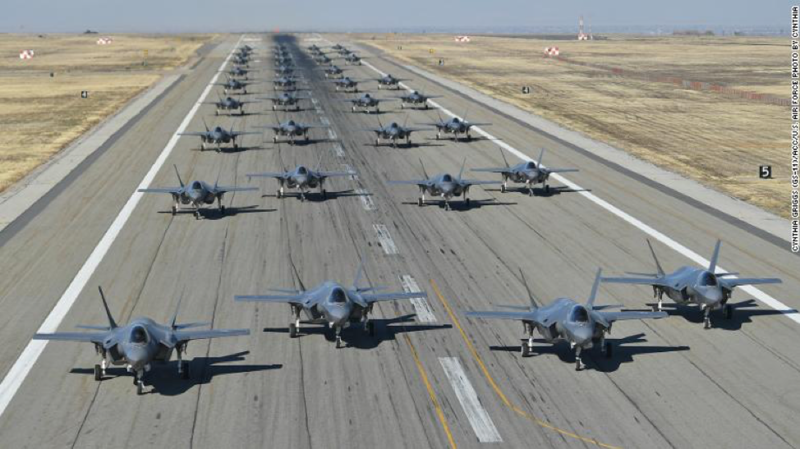 When he cancelled the F-22, Secretary Gates boasted that: “…by 2020, the United States is projected to have…nearly 1,100…advanced fifth generation F-35s and F-22s. China, by contrast, is projected to have no fifth-generation aircraft by 2020. And by 2025, the gap only widens.” He was badly mistaken. Today, under a year short of 2020, the Air Force has 186 F-22s and 153 F-35s. Too few F-35s are being procured each year—48 per-year for the Air Force—versus the over 100 per-year originally programmed. On the other side of the equation, China is beating all of Secretary Gates’ rosy projections. The Pacific power has fielded not one, but two 5th generation stealth fighters, the J-20 and J-31, and is also expected to field a stealth bomber with a range that will exceed five thousand miles within a year or two. When he cancelled the F-22, Gates dismissed the aircraft as “a niche, silver-bullet solution for one or two potential scenarios.” He could not have been more wrong. Air superiority is a fundamental condition for the employment of U.S. military forces. Forces on the ground, ships at sea, and support aircraft like cargo aircraft and aerial tankers will be ravaged if subject to enemy air attacks. U.S. and coalition tactics, operational constructs, and strategies are premised on the protection of attack from enemy air forces. War plans also depend on the ability for U.S. combat aircraft to strike enemy targets at range—destroying the centers of gravity that allow an adversary to sustain a conflict. That is why decisions like the premature curtailment of B-2 and F-22 production were tremendous mistakes. Past defense leaders robbed their successors of the very tools they require to defend the nation. Investments made in the Air Force’s future force structure must focus on combat aircraft able to effectively meet the security challenges identified in the current national security and military strategies. Specifically, China and Russia are radically advancing their military capabilities that threaten U.S. strategic preeminence. There are some in the Department of Defense who are advocating that the Air Force purchase new versions of legacy fighters as a means of achieving cost-efficiency—aircraft that were designed in the 1960’s and first started rolling off production lines in the 1970’s. Trying to adopt aircraft that belong in museums to warfare in the 21st century is a mistake. For the combat forces of the U.S. Air Force, technologies like stealth, the ability to achieve advantageous situational awareness through advanced sensors and processing capability, and the capacity to communicate throughout the battlespace to enable collaborative information sharing is essential. These capabilities are embodied in advanced aircraft designs like the F-35 fighter and the B-21 bomber. It is impossible to turn back the pages of history and redress the mistakes that led to the cancelation of the F-22 and B-2. However, leaders can learn from these errors and not repeat the mistakes that led to the decline of U.S. military preeminence. To reverse this decline will require a staunch commitment to revitalize the U.S. Air Force with advanced aerospace systems capable of giving the entire military the requisite aerospace superiority needed to win against any threat—not trying to achieve budget efficiencies by buying aircraft unable to survive against the threats of biggest concern in our national defense strategy.